The diversity of animal form and function is one of the most notable signatures of evolution. However, with a few rare examples, little is known regarding how animal performance has evolved. This is especially important in the context of complex funcitonal traits that play a key role for animal ecology and behavior. For example, many animals jump to capture prey or escape predators, yet remarkably little is known of the dynamics of jumping in any animal species, especially in a historical or behavioral context. The ability to examine these traits from an evolutionary perspective allows us to answer novel questions at the interface between evolutionary biology and functional morphology. Have animals evolved ways to jump at "optimal" angles for jumping? Is there co-evolution between different components of locomotion, such as acceleration and maximum speed, and are these aspects controlled by the same morphologoical traits? Moreover, our laboratory also examines how the body axis has evolved in squamate reptiles to understand macroevolutionary patterns of function and diversity. Finally, we also examine how many other kinds of environmental and intrinsic factors, such as substrate type, morphology, and gait type (e.g., bipedal vs. quadrupedal) influence animal locomotion. Jayne BC, Irschick DJ. 1999. Effects of incline and speed on the three-dimensional hindlimb kinematics of a generalized iguanian lizard (Dipsosaurus dorsalis). Journal of Experimental Biology. 202:143-159. Irschick DJ, Jayne BC. 1999. Comparative three-dimensional kinematics of the hindlimb for high-speed bipedal and quadrupedal locomotion of lizards. Journal of Experimental Biology. 202:1047-1065. VanHooydonck B, Herrel A, Van Damme R, Irschick DJ. 2006. 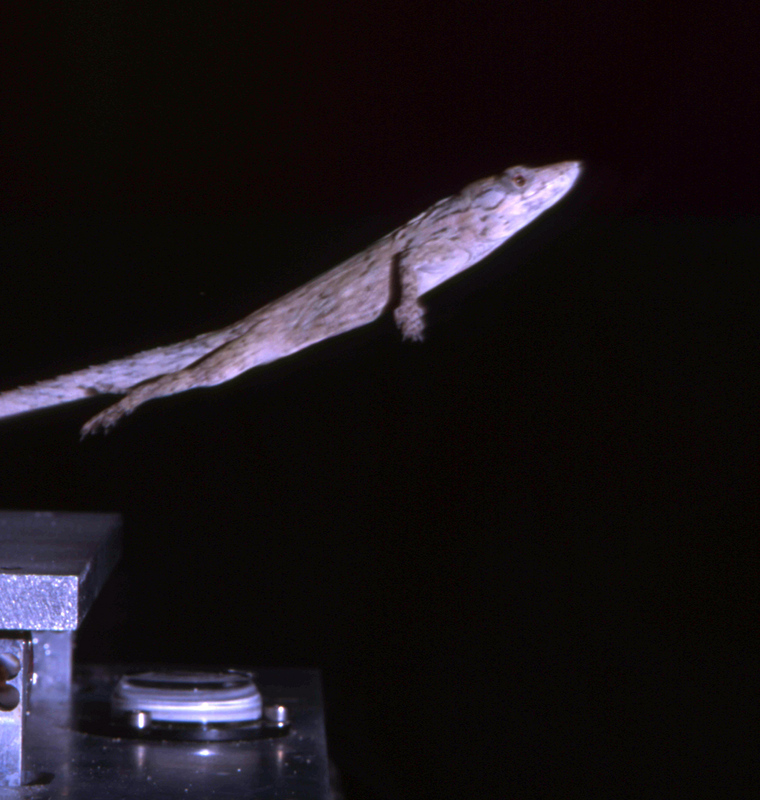 The quick and the fast: the evolution of acceleration capacity in Anolis lizards. Evolution. 60:2137–2147. Gillis GB, Bonvini L, Irschick DJ. 2009. Losing stability: tail loss and jumping in the arboreal lizard Anolis carolinensis. Journal of Experimental Biology. 212: 604-609. Featured on "The Daily Planet" by the Discovery Channel, Science Daily, The Toronto Star, Wired magazine.com, The Canadian Broadcasting Corporation ("Quirks and Quarks" show) and many other media outlets. Kuo, Chi-Yun, Gillis G, Irschick DJ. 2011. Loading Effects on jump performance in green anole lizards, Anolis carolinensis. Journal of Experimental Biology. 214:2073-2079. Moen D, Irschick DJ, Weins JJ. 2013. Convergence and conservatism in ecology, morphology, and performance across continents in frogs. Proceedings of the Royal Society of London B. http://dx.doi.org/10.1098/rspb.2013.2156.